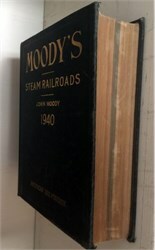 New York, NY: Poor's Railroad Manual Co., 1940. Hardcover. Back spine intact by small piece cut out. Complete but shows signs of wear. 11.5" x 9". Showing their Route and Mileage, Stocks, Bonds, Debts, Cost, Traffic, Earnings, Expenses, and Dividends, their Organizations, Directors, Officers, etc. 1922 pages. Complete.